Update 28 Jan 09:30 AM. UBS upgrades Maruti to Buy. Stock up 2%. Buy only on a dip during the day. I have shortlisted 2 longs for the following week starting 27 Jan 2013. I will wait for market opening on Monday and see the charts during the day and make an entry. Will give you an update when the position is entered and closed. For Swing trades, my stop loss is 4% or charts giving negative signal whichever is earlier. I observe this strictly, so profits are not exorbitant. But overall if I do 10-15 trades in a month , I will be in positive with at least 5-6% returns. Always follow dual time frame strategy when entering a trade. That is if you are trading positional / swing, look at daily and weekly charts and enter only if both are in the same direction. So I post both weekly and daily charts. For this week, due to the RBI policy announcements, there could be huge volatality. So I am not touching any banking stocks. It is risky to enter all the swing trades before Wednesday. 1. Long - Maruti Suzuki. (Good news + charts giving good signals). Please review the charts below. 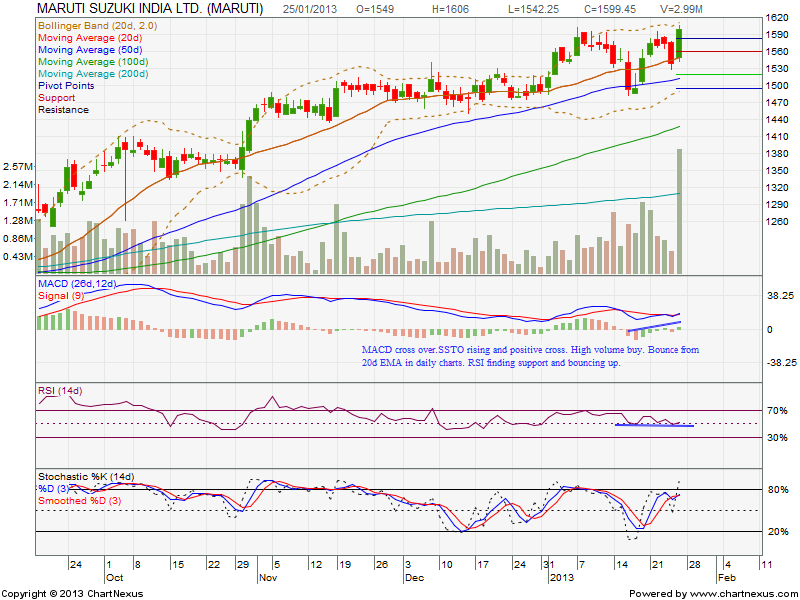 Maruti - Weekly Chart Observations. 3. RSI is above 70 and pointing up. 4. 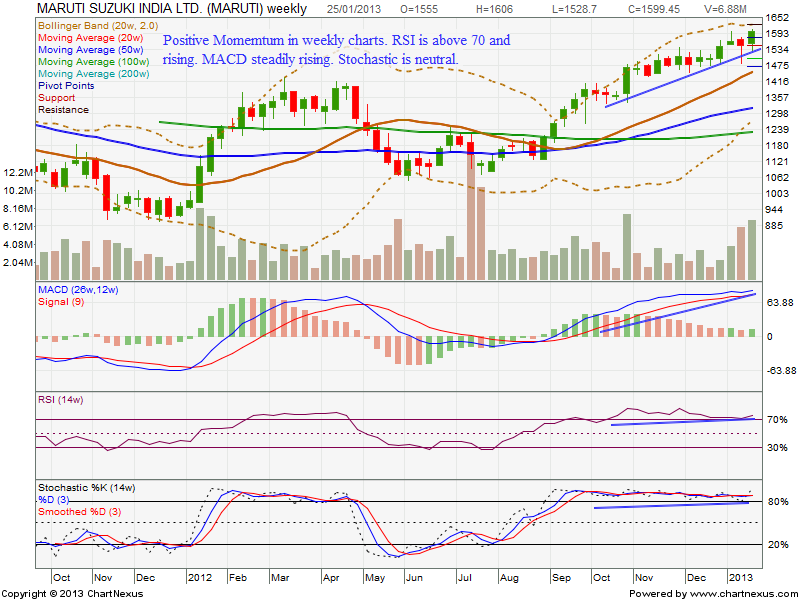 MACD is positive above signal line. 5. Weekly volume steadily increasing. 1. 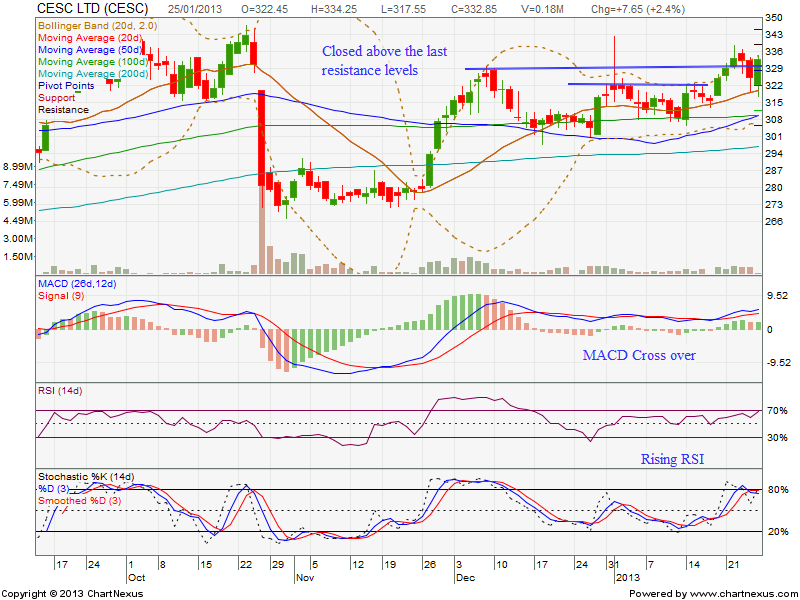 MACD cross over the previous day. 4. SSTO is heading upwards. Fast Stochastics has given a buy. SL is 5% or whenever the stock closes below 20 day EMA. Very good buy signals in Weekly and 30 minutes charts. 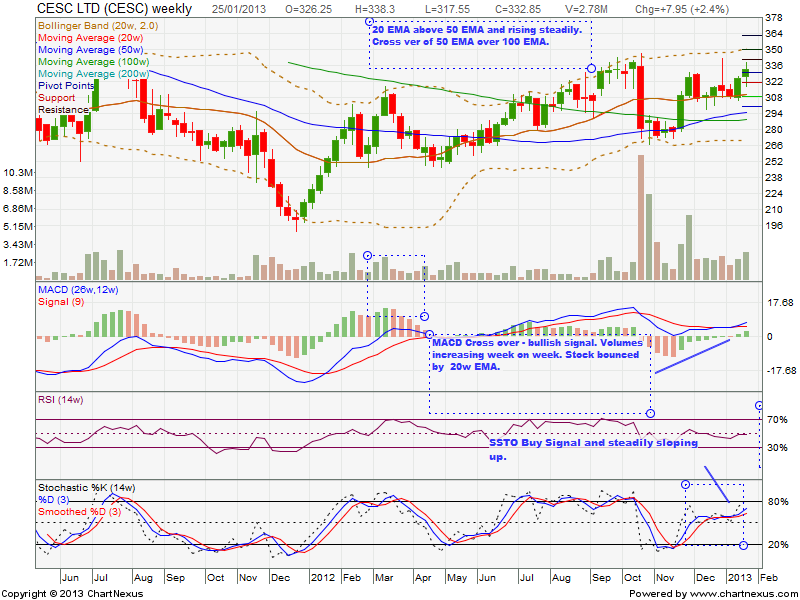 CESC - Weekly Chart Observations. 1. Weekly uptrend in tact. 1. MACD Cross over and positive over past one week and continuing to move up. 2. Closed above a recent resistance. 3. RSI is rising and tending to cross above 70. You can see that RSI is touching 70 after October 2012 for the first time now. 4. Fast Stochastics has given a buy.